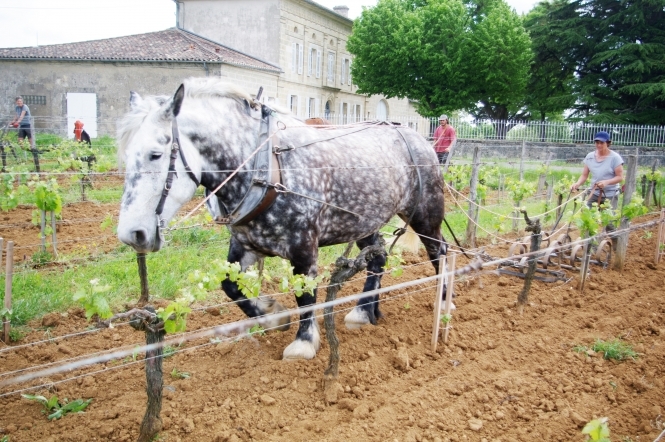 When Château le Puy started using horses it was driven by necessity and they have helped save the vineyard, which has been producing wine without a break since 1610. In the 1980s, vines began to suffer from black rot, a fungal disease that is one of the deadly maladies de bois. For years the accepted treatment was spraying with an arsenic-based fungicide but this is now banned and was not acceptable to Château le Puyand its organic permaculture practices. Black rot thrives in wet and humid conditions and when agronomist Claude Bourguignon was called in to advise he said tractors were to blame. The vineyard in the small Côtes de Francs appellation sits at 140m in the highest spot in Gironde department, and has just 60cm of light red-brown clay soil sitting on limestone bedrock. Mr Bourguignon, one of the first scientists to warn that modern agricultural methods were devastating micro-bacteria in soils, traced the problem to excessive standing water in the vines, caused mainly by the compaction of the clay due to tractors driving in the same ruts between the vines.